Slotland's new Fair Tycoon slot game is now available in their instant-play online casino. The new slot features a sim-city style bonus game where you create your own fair and win cash by keeping your fair-goers happy. The unique casino is giving you a $10 freebie to try the new game ($20 for VIP players). This week there's also a 115% match bonus for the new game. "It's no wonder this game has been so popular at WinADay Casino, where it originated," said Slotland's manager, Michael Hilary. "It's like a Sim slot game only you build a fair rather than a city. And you can win money if you get it right!" You get attractions for your fairground in two ways. Rides and food vendors can be purchased with Fair Credits which are won by hitting the special Fair Credits symbol on the reels. Premium attractions, such as roller coasters and ferris wheels, are won by hitting Scatters. The new slot is a 5x3, 17 payline slot with a premium bonus game where you'll choose your favourite attractions and build your own summer fair. 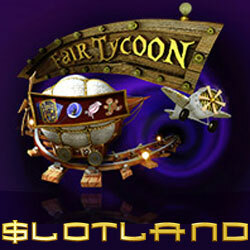 Fair Tycoon has a very wide betting range; you can bet from $.05 to $68 per spin. "You've got to make sure your fair is FUN," said one player. "You can win some nice bonus cash if you keep people happy!" This week there's also a 40% match bonus with a 23X wagering requirement that can be claimed 3X per day and be used to play any of Slotland's more than 60 unique games.